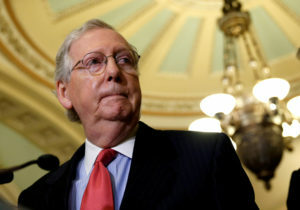 Senate Majority Leader Mitch McConnell is declining Democrats’ request for a briefing by FBI agents on the investigation into Supreme Court nominee Brett Kavanaugh. McConnell said in a letter Wednesday to Senate Minority Leader Chuck Schumer that he believes Democrats would only use such a briefing to delay Kavanaugh’s confirmation. The GOP leader also said a briefing by FBI agents would be “unprecedented and irregular” and not in keeping with previous practice. The FBI is expected to soon provide senators with the results of its investigation into allegations of sexual misconduct by Kavanaugh when he was in high school and college. Kavanaugh has denied the claims. The FBI’s files are confidential. Only senators and authorized staff will be able to read them.